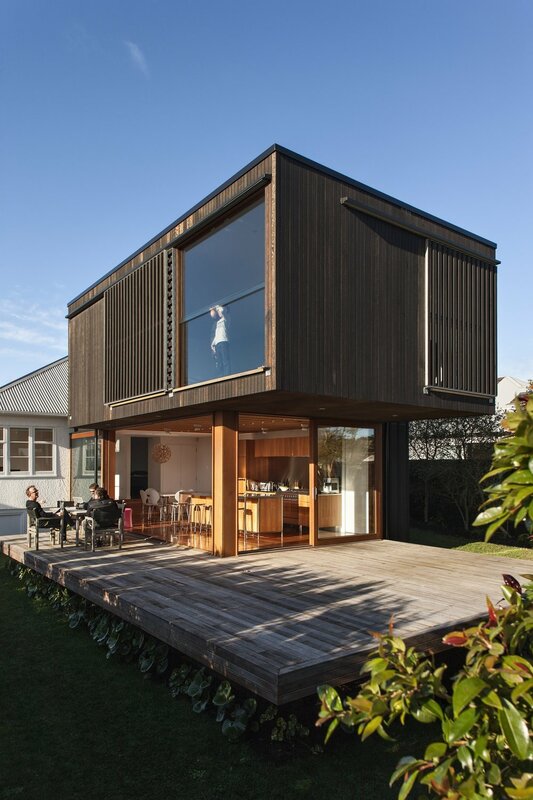 The brief for this addition was for concrete, timber inside and out and timber slats - with a contemporary aesthetic and a good connection to the outside and to upper level sea views. The existing house was to remain intact, with the addition to the rear a separate unit with a link to the original. The new extension is made up of two stacked rectangular boxes offset so that the upper cantilevers in two directions over the lower, which forms a bridge back to the existing house. 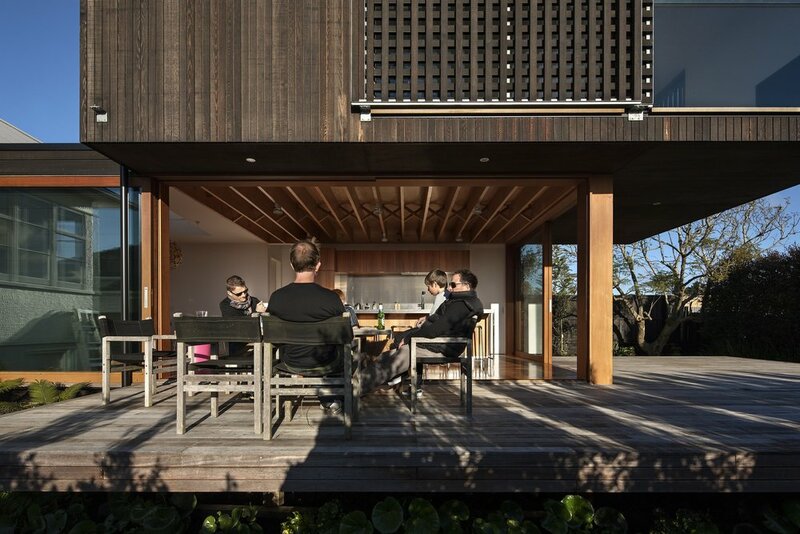 The upper level box is clad in dark-stained cedar vertical weatherboards, with slatted shutters giving privacy to generous glazing which takes advantage of sea views. The lower box has full height sliding glass doors, which open fully to dematerialise the boundary between floor and level deck, allowing the upper level to float freely over the open living space below. A separate rectangular box clad in cedar ply is applied to the south elevation, forming the stair enclosure - connecting the two levels and opening out to framed views. The new upper and lower spaces are both generous open plan living areas, while bedrooms are housed within the existing house. The main living space opens out onto extensive decks, and is positioned a step below the existing floor level to create a good connection to the ground level. The black and silver of the new exterior cladding and deck is complemented with the warmth of the timber interior linings, cabinetry and ceilings. 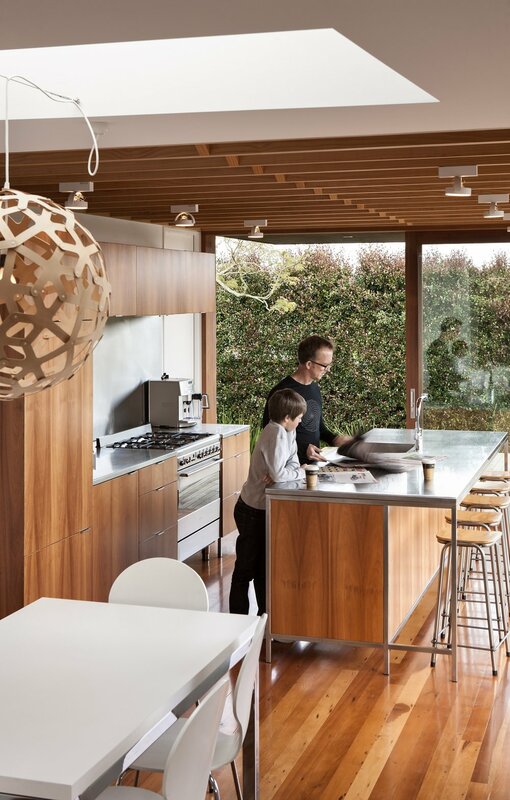 Exposed ceiling framing with herring-bone struts creates a sculptural timber element within the new living space. The project incorporates a rich materiality, texture and colour, and provides a degree of openness and sense of space which fully utilises and connects with the site.